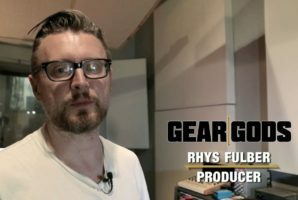 Night Verses guitarist Nick DePirro takes us through his live and studio rig in this special edition of Rigged! Buy their new album From The Gallery of Sleep on any service here and see below for upcoming show dates. I have two JP15 Ernie Ball Music Man 6 string guitars, and a Strandberg Boden OS 8 string with me on this tour. I use mostly the black JP15 (6 string) for 90% of the set, until we play “No.0”, and I switch to the Strandberg (8 string) during the bridge/outro of the song. I basically have 16 bars to switch guitars, so I keep the 8 string close by to make the switch as seamless as possible. I use a Blackstar Series One 100w 6L6 head, with two 2×12 Series One cabs. I use one 2×12 on each side of the stage, and run my head through them both. I generally use the rhythm distortion for my main tone, and switch between the other 4 channels as needed. Our songs range in dynamics pretty frequently, so it’s helpful to have 4 different tones at my disposal. Powered by a Decibel Eleven Hot Rod Deluxe and a few One Spots. I use each of these pedals through out our set, but the main ones in use are definitely my delays, reverbs, and the Whammy.